Victor J. Ghezzi was born October 19, 1910 in Rumson. He showed great promise as a teen golfer during the 1920s and honed his game at the Deal Country Club. Vic did not have the classic build for a golfer. Broad, muscular and standing 6’3”, he was often compared to a football fullback. However, he was not a long hitter; instead, he excelled with short irons. Vic turned pro in 1932 and won his first tournament in 1935, defeating John Revolta at the Los Angeles Open in an 18-hole playoff on a rainy day. Prior to playoff, they agreed to split the first- and second-place money. Vic won two other tournaments in 1935, and two more in 1936—the Hollywood Open and PGA Championship of New Jersey. He won the New Jersey Open in 1937. He won three PGA Tour events in 1938, including four-ball championships partnered with Sam Snead and Ben Hogan. In 1939, Vic was selected for the Ryder Cup team. 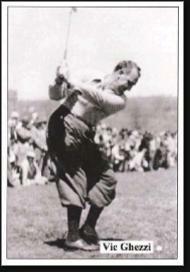 He also was picked for the Ryder Cup in 1941 and 1943, but he never played a stroke because of World War II. Vic had his greatest moment in 1941 at the PGA Championship in Colorado. He advanced through the match-play draw to face Byron Nelson in the finals, defeating Ralph Guldahl, Ben Hogan and Gene Sarazen on successive days. Vic matched Nelson stroke for stroke through 36 holes to force a sudden-death playoff. In the 400-yard second hole, both players made magnificent chip shots to within three feet of the pin, and had to flip a coin to determine who was closest. Nelson putted first and missed by less than an inch, Vic’s putt started wide, but caught enough of the hole to side-door into the cup. Although this was his only major, Vic won 11 PGA Tour events, and another six non-tour events, including three New Jersey Opens and two New Jersey PGA Championships. Vic’s last hurrah came at the 1946 U.S. Open, when he finished regulation in a three-way tie with Nelson and Lloyd Mangrum. After 18 holes, the three players were still tied. Finally, Mangrum won by a single stroke. Vic was enshrined in the PGA Hall of Fame in 1965. He became a sought-after teacher in the NY-Metro are in the 1950s and 1960s, working out of Englewood. Among his students were Dan Topping, who owned the Yankees, as well as Mickey Mantle, Whitey Ford and Yogi Berra. Vic passed away in 1976 at age 65 from cancer in a Miami hospital.